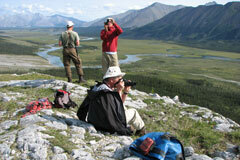 The Wind River is a 200 km long river that winds its way through the Mackenzie Mountains in northern Yukon. It is so remote that it can only can be reached by floatplane. This adventurous wilderness canoe expedition has whitewater rapids to Class II. The tundra and the breathtaking mountain scenery with caribou, dall sheep, moose and bears provide a feast for the eyes and camera. Day 1: You will be picked up from the airport and brought into Whitehorse to do any last errands before heading north. After 180 km on the Klondike Highway, we camp at the Coal Mine campground in Carmacks. Day 2: We drive another 230 km to Mayo. From there we fly with an Otter float plane for about an hour to McClusky Lake. We portage our gear on a trail to a small stream which flows into the Wind River. Then we line the loaded canoes down the stream for about 2 hours until we reach the river. Here we set up our first campsite. Day 3-11: The 200 km on Wind River provides a lot of paddling excitement. Small rapids, rocks and fast flowing water always require our diligent attention. On these days we will also do some hiking where the views across the tundra and the surrounding mountains are breathtaking. In camp, we fish for arctic grayling and bake bread as well as bannock in the Dutch Oven. We paddle through a narrow canyon to reach the Peel River. Day 12-13: At first on the mighty Peel River we paddle along high rock walls. 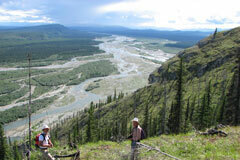 Later on we reach the Lower Peel Canyon just after the mouth of the Bonnet Plume River. Here the river is again narrow and fast and we meet high standing waves. We set up our last camp below the mouth of the Snake River on the gravel bank known as "Taco Bar". Day 14: After breakfast we are picked up by the floatplane and fly for two hours over the mountains to Mayo. From there we drive 410 km by van along the Silver Trail and Klondike Highway to Whitehorse. When we arrive in Whitehorse we celebrate our adventure with a dinner. Hotel accommodation is also in Whitehorse. Day 15: We offer a shuttle to the Whitehorse airport. We offer this tour upon your request for groups of 5 to 11 people. You select the travel dates and the itinerary can be modified to your liking. Prerequisites: This canoe trip is suitable only for experienced canoeists. Participants should have previously paddled a river like the Big Salmon River or its equivalent. The ability to safely handle a canoe in Class II rapids is vital. A good athletic condition is also strongly advised.